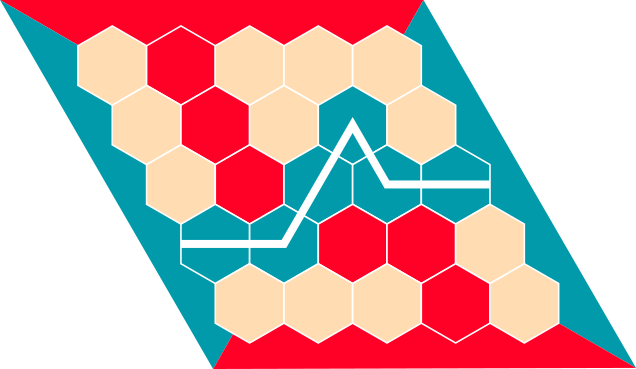 Hex is a strategy board game played on a hexagonal grid, theoretically of any size and several possible shapes, but traditionally as an 11×11 rhombus. Other popular dimensions are 13×13 and 19×19 as a result of the game's relationship to the older game of Go. According to the book A Beautiful Mind, John Nash (one of the game's inventors) advocated 14×14 as the optimal size. Each player has an allocated color, conventionally Red and Blue or White and Black. Players take turns placing a stone of their color on a single cell within the overall playing board. The goal for each player is to form a connected path of their own stones linking the opposing sides of the board marked by their colors, before their opponent connects his or her sides in a similar fashion. The first player to complete his or her connection wins the game. The four corner hexagons each belong to both adjacent sides. You may use any program or language. Do not use any third party libraries or modules (full or in part) that implements the same game. The rest are fine. Players are computer and user. You may choose the size of the grid. You may use either CLI or GUI for output (see points). Your code should not exceed 5120 bytes. # Tell the user, if they wish, their next best move. +150 points if your bot is undefeatable. Add this points ONLY IF you are absolutely certain of your bot's 100% winning capability. If any user defeats your bot and reports it all your points will be taken away (zero points). The person reporting this must either post a screenshot or input sequences based on the implementation of game. They will be awarded +150 points, if they have posted an answer. Hi, this is my very first code golf, but I think, the following code works quite well (it's a full HTML page, 3848 bytes). The code uses the HTML5's canvas-tag to display the game (14x14 board). You can undo the last step and play against another player (enable Multiplayer) or the computer, but its AI is still very weak (it just uses a random position to place the next field). The entire graphical design is based on your screenshot. Except for the use of GraphicsComplex, this code is entirely ungolfed. The # of players selector chooses the number of players. Note that there is a bug that allows you to change between 1-player (human vs. cpu) and 2-player (human vs. human) while a game is in progress. Start lets the computer start playing in 1-player mode. Undo takes back the last player's move in 2-player mode. Reset sets the board back to the starting position. Clicking on a hex when it is a human's turn plays in that hex. Note that there is a bug that allows a click outside the playing field to select hex 1,1. 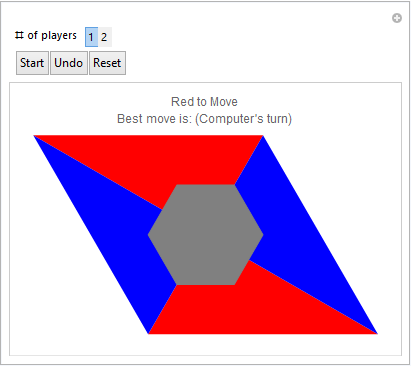 Red always goes first, and in 1-player mode Red is always controlled by the computer. The computer always plays perfectly. Not the answer you're looking for? Browse other questions tagged code-challenge board-game hexagonal-grid or ask your own question. Connect 4: Spot the Fake!